Black [blak] adjective 1. ?dark-skinned: belonging to an African people or to another ethnic group with dark skin, e.g. Australian Aboriginals 2. 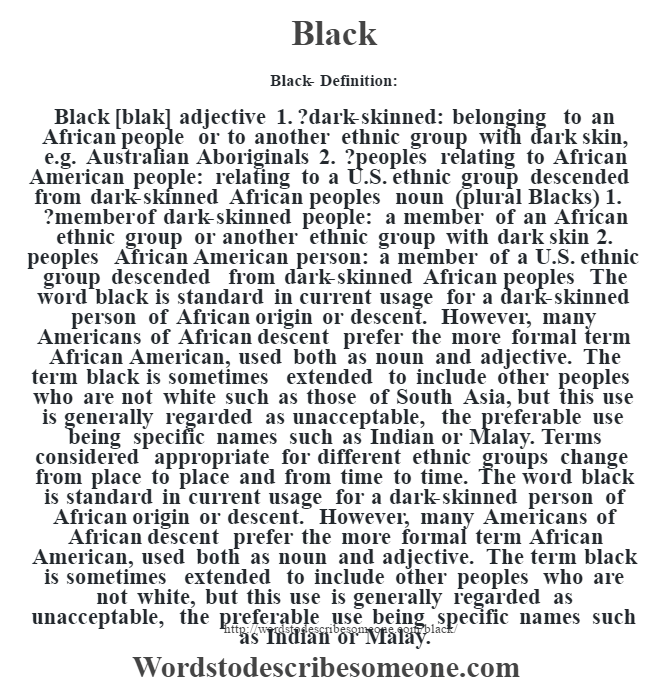 ?peoples relating to African American people: relating to a U.S. ethnic group descended from dark-skinned African peoples noun (plural Blacks) 1. ?member of dark-skinned people: a member of an African ethnic group or another ethnic group with dark skin 2. peoples African American person: a member of a U.S. ethnic group descended from dark-skinned African peoples The word black is standard in current usage for a dark-skinned person of African origin or descent. However, many Americans of African descent prefer the more formal term African American, used both as noun and adjective. The term black is sometimes extended to include other peoples who are not white such as those of South Asia, but this use is generally regarded as unacceptable, the preferable use being specific names such as Indian or Malay. Terms considered appropriate for different ethnic groups change from place to place and from time to time. The word black is standard in current usage for a dark-skinned person of African origin or descent. However, many Americans of African descent prefer the more formal term African American, used both as noun and adjective. The term black is sometimes extended to include other peoples who are not white, but this use is generally regarded as unacceptable, the preferable use being specific names such as Indian or Malay.